With the launch of the 2019 at the 2018 New York International Auto Show, Toyota has given its most important vehicle a broadened market appeal that the company believes will appeal to both sexes. Toyota hopes the redesigned crossover will appeal to more men than previous iterations of the . The new formula includes a new, more outwardly tough design, more power, a better all-wheel-drive system, and at least some semblance of athleticism. Plus, there’s increased interior volume and chunkier controls on the center stack. “We’ve doubled sales in the last four years, so when you do that and you’re at the 400,000 level, you have to appeal to a broader part of the market,” Bill Fay, senior vice president of automotive operations, told . “We put part of that challenge into the development of this.” The company plans to achieve its goal by creating more differentiation between the trim levels in terms of both form and function. The Adventure trim offers a more aggressive front fascia that’s completely different than the rest of its siblings, but it also gains upgraded suspension and torque-vectoring all-wheel-drive. The current Adventure is packaged with a sad wheel upgrade. There’s even a sports option with the new XSE trim, which brings a more powerful powertrain and painted black exterior accents that play up the crossover’s extremely mild performance prowess. 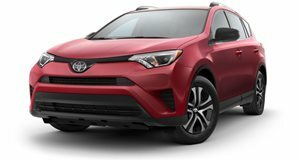 On the other end of the spectrum will be the more luxurious Limited trim, which Toyota expects will sell predominately to women based on the trim’s more upscale materials and more comfort-oriented dynamics. The XSE, Adventure, and Limited are all unique looking vehicles despite sharing nearly 99% of their parts. It will be interesting to see if Toyota’s increased segmentation proves able to pull in more male shoppers.